Hamsters are born with a full set of teeth that grow continuously throughout life. If your hamster's teeth become overgrown, they can cause injuries to his mouth and interfere with the alignment of his jaw. You can help keep your pocket pet's teeth down by placing safe, hard objects in his cage for him to gnaw on. Providing your hamster with a variety of wooden and tree-based toys will give him something to play with and chew on to help keep his teeth worn down. Pet stores sell untreated wooden blocks in various shapes and sizes that you can place in his cage. You can even purchase an untreated four-by-four of lumber and drill big holes in the piece to make it more interesting for your hamster. Giving your hamster certain crunchy snacks can help keep his teeth trimmed, while also providing him with some healthful nutrients. The ASPCA recommends the occasional dog biscuit, and you can also purchase treats in pet stores that have been oven baked and contain a blend of vegetables, nuts and grains. In limited quantities, fresh fruits and vegetables like carrots, celery and apples can be offered as a crisp morsel. Calcium treats and mineral blocks can be either placed in your hamster's cage or attached to the side of a wire habitat for easy access. These stones will supplement your hamster's normal diet with extra calcium and vitamins, while also giving him another item that he can chew on to keep his teeth worn. Your hamster can carry and toss the loose blocks around his cage as a form of play that will also sharpen his teeth. Domesticated hamsters have a much more diverse selection of toys and treats available to them than their wild ancestors. 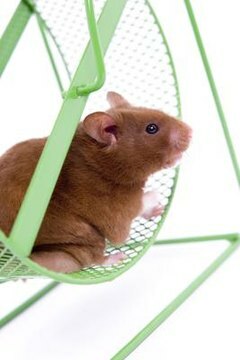 But you can still look to nature to find items for your hamster's cage that can help wear down his teeth. For example, Hamsterific recommends pine cones, while the ASPCA suggests twigs or pieces of wood that haven't been exposed to any pesticide treatments.